Local skeptics of Arlington’s efforts to lure Amazon’s second headquarters to the county are convening a community forum tomorrow (Thursday) for people to air their own concerns about the project. Our Revolution Arlington, the local chapter of a national group created out of U.S. Sen. Bernie Sanders’ presidential bid, is planning a “community town hall” on the issue from 7-9 p.m. at Arlington Central Library. Other activist groups, including the Arlington Green Party and the county’s chapter of the Democratic Socialists of America, are co-hosting the event. The county’s bid to lure the tech giant to Arlington has attracted concerns ranging from the impact the company might have on rent prices to the wisdom of the county and state offering tax breaks for the massive company. With observers of all stripes hypothesizing that Arlington has an excellent chance of winning HQ2, organizers say they wanted to create a space to get these issues out in the open. Abraham said the event will primarily be a chance for the County Board to “listen to what we have to say,” rather than the other way around. Abraham even swung by the Board’s meeting Saturday (June 16) to invite members to the gathering — he says both Erik Gutshall and John Vihstadt subsequently told him they’d try to attend, while the others either didn’t respond or had conflicts. In response to Abraham’s request, County Board Chair Katie Cristol noted Saturday that the Board does not “have any new information to report” on the company’s decision-making. Vice Chair Christian Dorsey also pushed back against any insinuation that the county is somehow holding back a chance for the public to make their voices heard on the issue. “We don’t know anything about it, there’s been no discussions with this board, there’s been no chance for public engagement that we’ve denied,” Dorsey said. 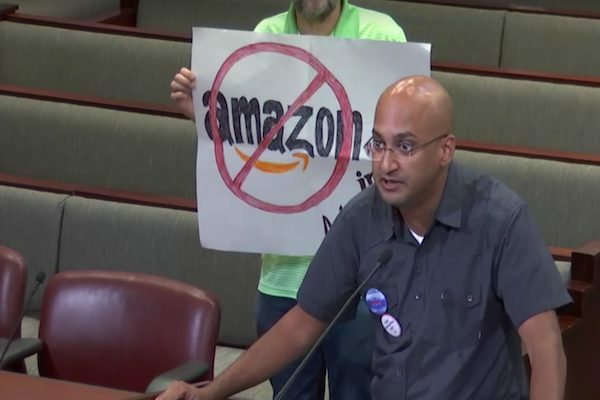 Those responses struck Abraham as the Board just “spewing off talking points,” underscoring his desire to shine a light on what the public thinks about Amazon. “Getting that response made it all the more clear to me that the County Board needs to be listening to us,” Abraham said. The Arlington GOP has also raised persistent concerns about the transparency of the county’s efforts to woo Amazon, bringing them into rare alignment with groups like Our Revolution. Some local Republicans also attended Saturday’s meeting to raise the issue once more.
.@kcristol, @caffeinatedpro, @libbygarvey, @voteforvihstadt, and @erik4arlington owe it to taxpayers to be transparent about discussions with Amazon re: HQ2.